Hyderabad, February 9th, 2013: Hon’ble Minister of State for Human Resource Development (Higher Education) Smt. 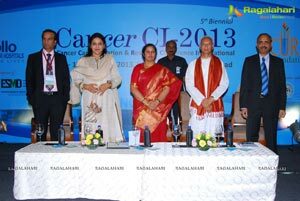 Daggubati Purandeswari formally inaugurated the 5th Biennial Conference CANCER CI – 2013, in the presence of Dr Prathap C. Reddy, Chairman, Apollo Hospitals Group on Friday at Taj Krishna. Dr. P. Vijay Anand Reddy, Director, Apollo Cancer Hospital & Chairman, Scientific Committee, Cancer CI and Dr. Prabhakar Tripuraneni, La Jolla, CA, USA & Former President of American Association of Radiation Oncologists, were also present on the occasion. 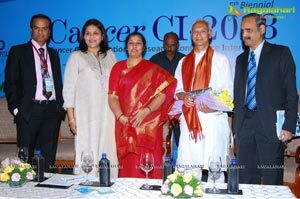 This prestigious international conference organized by Apollo Cancer Hospital, Hyderabad and CURE Foundation will be on till February 10th, 2013. The CANCER CI – 2013 is focussing on a broad spectrum of topics in cancer management of Gynaecology, Breast, Head & Neck & G.I., with the faculty comprising of some of the most eminent specialists from India and abroad. Over 2300 delegates from India and abroad are attending the conference. This was announced by Dr. P. Vijay Anand Reddy, Director, Apollo Cancer Hospital & Chairman, Scientific Committee, Cancer CI; Dr. Prabhakar Tripuraneni, La Jolla, CA, USA & Former President of American Association of Radiation Oncologists and Dr. T.P.S. Bhandari, Consultant Surgical Oncologist, Apollo Cancer Hospital at a Press Conference here, today. According to Dr. Vijay Anand Reddy, the Conference will deliberate on various advanced Radiation technologies in the management of malignancies in Gynaecology, Breast, Head & Neck & G.I. with active participation from allied specialities and special emphasis on new technology and evidence based management guidelines. The faculty for the conference comprises of 8 internationally eminent oncologists apart from 82 National Speakers from all over the country. 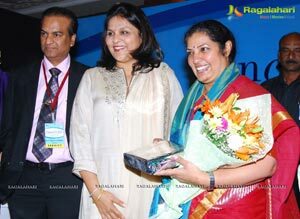 The renowned oncologists participating in this conference include Dr. Akila Viswanathan, Boston, MA, USA is an authority in Gyn. Cancer; Dr. Avraham N. Eisbruch, Michigan University, USA, is an authority in Head & Neck Cancer; Dr. Jennifer R. Bellon, Boston, USA, is an authority in Breast Cancer; Dr. John Suh, Cleveland, USA, is an authority in CNS, SRS, Contours; Dr. Karyn A. Goodman, Memorial Sloan Kettering, New York, USA, is an authority in G.I. Caner; Dr. Patrick Kupelian, Los Angeles, USA, is an authority in GU/Contours; Dr. Prabhakar Tripuraneni, USA, is an authority in Head & Neck and Neuro Oncology; Dr. Stephen M. Hahn, Philadelphia, USA, is an authority in Protons/GI/Lung Cancers. 1. Pre-conference Surgical workshop for 1 week (February 1st – 8th, 2013) in the entire Country. More than 100 Robotic Surgeries were performed across the Apollo Cancer Hospital group. 2. Pre-conference Practical Workshop for Radiation Oncology on February 8th, 2013. 3. Practice changing innovations in all common Cancers Gyn. Cancer, Breast Cancer, Head & Neck Cancer and G.I. Cancers. 4. Interactive Panel discussion where the delegates will participate in the polling to advice patient, treatment in different situations.